10 Gigabit Ethernet, or 10GigE, supports 10 Gbit/s over cable lengths over 80m without repeaters or optical extensions. This makes 10GigE ideal for applications needing high bandwidth over long distances.Figure 1. 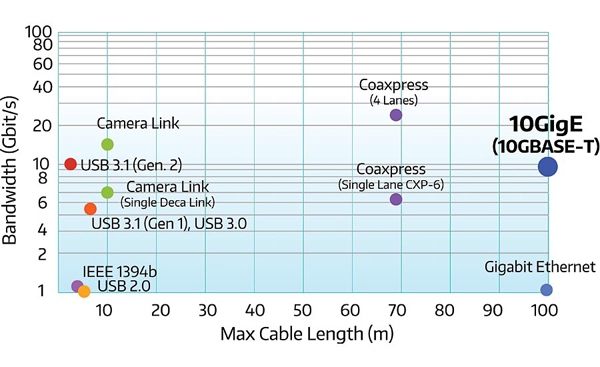 Bandwidth vs cable length. 10 GigE provides both high bandwidth and a long maximum cable length without repeaters or optical extensions. With 10 Gbit/s of bandwidth, 10Gige enables users to take full advantage of the latest high-performance sensors with their higher resolution, frame rates and dynamic range. Image data is only useful once it arrives in host memory. 10GigE offers packet resend to prevent data loss by detecting and correcting errors in real-time. By contrast, Camera Link requires expensive cables to manage bit errors. In addition to being faster and easier than single lane Camera Link and CXP-6 CoaXpress interfaces, 10GigE over CAT6A is much less expensive. By maintaining GigE Vision compatibility, 10 GigE cameras eliminate the need for expensive frame grabbers. Camera Link, CoaXpress, and optical fiber installations require expensive premade cables. Using CAT6A cables with the familiar RJ45 connector allows for quick and easy field termination. With 10 GigE you always get the perfect length of cable, so you only pay for what you need. Inexpensive cabling reduces the lifecycle cost of CAT6A installations by lowering maintenance expenses compared to Camera Link, CoaXpress and SFP+/Fiber. Using standard CAT5e cables for distances under 30 meters yields additional cost savings. The superior speed of 10 Gigabit Ethernet delivers a significant reduction in latency compared to gigabit hardware, which introduces 50-125 μs of latency with each IP forwarding step. 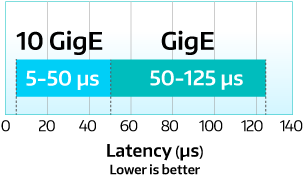 10GigE reduces this latency to just 5-50 μs, making it ideal for lag-free, real-time video applications such as motion-tracking, closed-hatch driving, virtual reality, and telemedicine. 10GigE devices on Gigabit Ethernet hardware will automatically step down to gigabit speed. This backwards compatibility enables a simple uFLIRade path. The 10GigE interface builds on proven GigE Vision technology to keep bandwidth and CPU usage low. 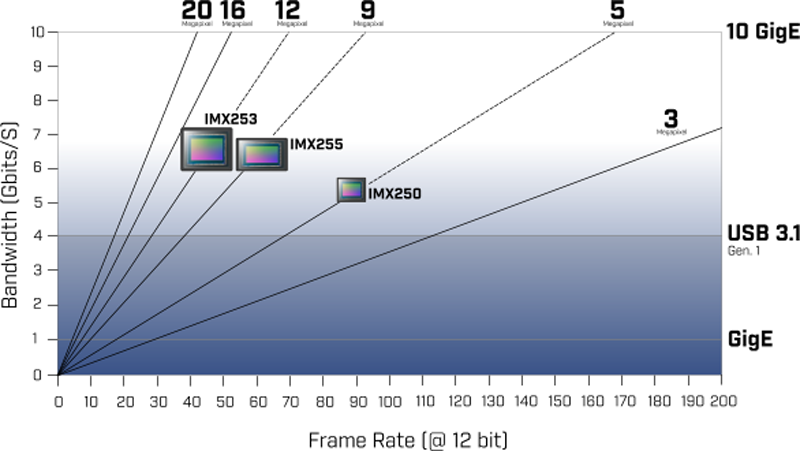 In FLIR’s tests, a free-running 10 GigE camera consumes only about 15% of the maximum load of an Intel i7-6700 CPU. 10GBASE-T has been widely adopted and has proven as reliable as the 1000BASE-T systems that came before. The increasing availability of consumer 10GBASE-T products is driving continued growth of the install base for this standard and building a highly favorable customer ecosystem. 10 Gigabit Ethernet is fully compatible with the GigE Vision protocol, ensuring computability with your existing GigE Vision software. #10 Higher quality, more competitive prices, faster delivery. 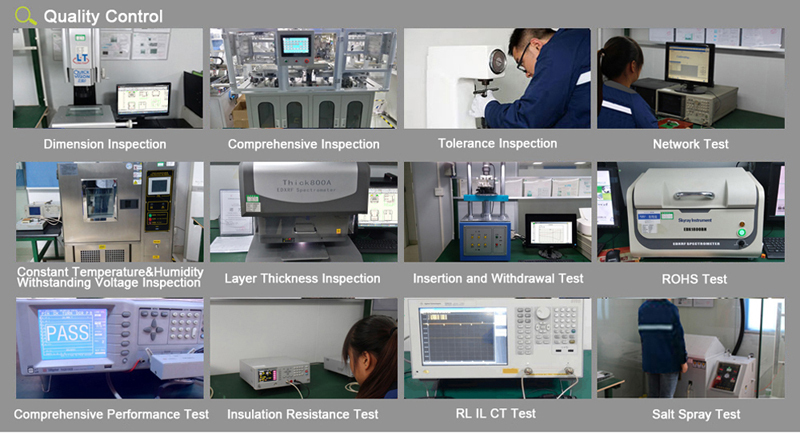 Our 10GbE has a higher quality, more competitive prices, faster delivery.Cost reduction, lead time within 2 weeks( with 2 factories more than 800 workers in centre province of China). Every module tested (not just batch tested). We provide perfect service and more in line with market requirements of the products.Don't hesitate to contact us for more details.